The Rooftop Rodeo is produced by Estes Park Western Heritage, Inc., a non-profit organization supported by a committee of dedicated volunteers who contribute their time and talent to help the Town of Estes Park produce the award winning Rooftop Rodeo. To be eligible for membership in Estes Park Western Heritage, Inc. you must be at least eighteen years of age and reside within the Park R-3 School District; up to 25% of membership positions are available for non-residents, those who live outside the school district. 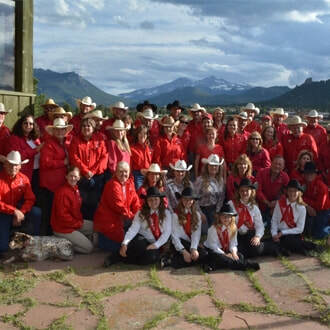 Active members comprise the main governing body of the Estes Park Western Heritage, Inc. Members are expected to attend at least seven committee meetings during a twelve month period, participate on working sub-committees, and work the Rooftop Rodeo. To be eligible for active membership you must first join the organization as an Intern. Becoming an intern is your foot in the door. Interns must be recommended by an active member, complete and submit an application form, commit to attending at least seven committee meetings during a twelve month period, and work one Rooftop Rodeo. Interns are then eligible to be considered for general membership.